Before there were aerobic steps, wearable fitness trackers or fancy workout tights, there was an inventor with a dream. Back in the day, entrepreneurs would hit up friends and family for funds. Nowadays, you can pitch your dream to TV’s “Shark Tank” or simply go online and launch a Kickstarter, a public funding platform for new projects. Like an idea? Donate money and you’ll get first dibs on the product, a shout-out or a gift. 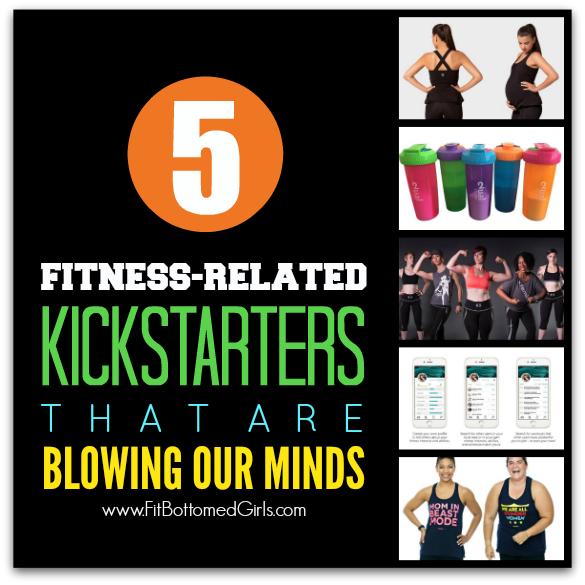 Here are a few fitness-oriented Kickstarters that have buzzed onto our radar. Some of these companies are still getting off the ground; others are newly established and looking to take their business to the next level. “Let’s start a movement. Let’s change the fitness industry for the better.” That’s the message that Thick to Thin owner Andrea Kuchinski wants backers to hear with her line of fitness wear for all shapes and sizes. 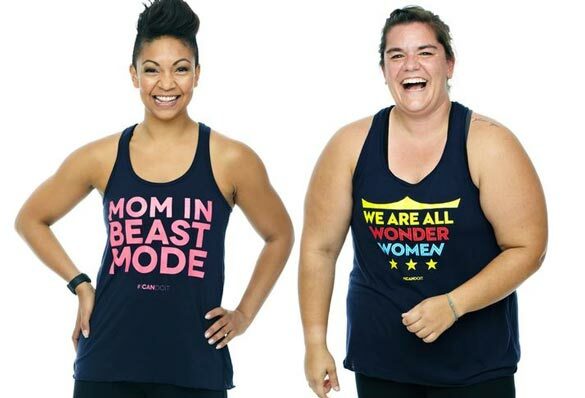 Tired of tiny shorts and see-through tank tops and workout tights Kuchinski decided to take matters into her own hands and create a line of clothing that’s functional, fits sizes XS to 5XL and carries an inspiring message. Her line has expanded from a series of tank tops to include tees, pants, shorts and accessories. Ever make a post-workout protein shake too far ahead of time? Not fond of drinking that glop? Neither was Roman Keyfman, a German health enthusiast. So he designed a plastic shaker bottle that keeps the liquid in one chamber and the powder in another. Unscrew the lid part way, give the bottle a shake and voila — a protein shake. There’s also a little compartment in the lid for stowing your supplements. 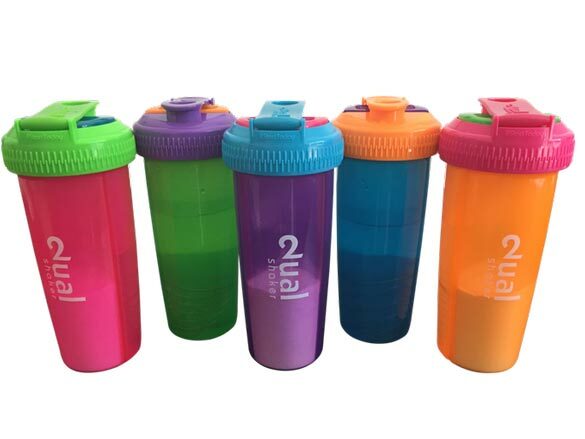 The bottle comes in five vibrant colors and if you pitch in $17 (early-bird) or $28 (after the early-birds run out) to his Kickstarter, you’ll get a Dual Shaker with free shipping worldwide. Dana Ram, a personal trainer, wife and mom of two, was looking for functional fitness clothing while she was pregnant but just couldn’t find workout wear that lived up to her expectations. So she created Gaya Fitness, a line of tops and capris for mamas who work out. Right now there are two tops and two capris — one set designed for runners, the other for stretchier activities, such as yoga and CrossFit. Both sets of capris have an adjustable toggle at the waistband to expand as you do, and also to cinch back once the baby is born. Looking for a workout buddy? Instead of goading your disinterested sister to join you on the track, wouldn’t it be nice to find a motivated fitness partner in your neighborhood? Wes Viner and his three partners are passionate about making fitness a social activity, so they created FitFuse, a phone app that finds you a fitness partner, whether it’s at the gym, out for a jog or walk, an early-morning surfin’ safari or even a pickup basketball game. You can find a person by neighborhood, gym, fitness level or fitness interest. 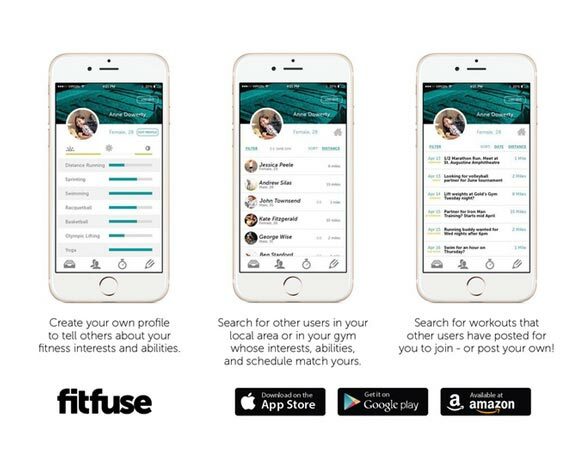 The app isn’t available quite yet but you can get an update on its release at FitFuseApp.com. Does working out make you feel like a superhero? Well, then, you need a superhero uniform! Roller derby queen Micki Krimmel started the line of workout clothing because she knows that fitness doesn’t stop at size 12. The centerpiece of the line is its Superfit Performance Leggings, which will be produced in diamond and laser patterns. There’s also a great muscle shirt with the message “the gym is my phone booth,” echoing the superhero message. Sizes will run from XS to 3XL.